Everybody has to sell something. When you want to marry someone, you need to sell yourself as the most eligible partner around. When looking for a job, you’re selling your skills. Even serious artists — who cringe at being accused of “selling out” — must somehow compel patrons, critics and their intended audience to “buy” the core aesthetics of their craft. Ultimately, success (in and out of business) depends on how well you have sold a product, a service, a brand, a person or an idea. 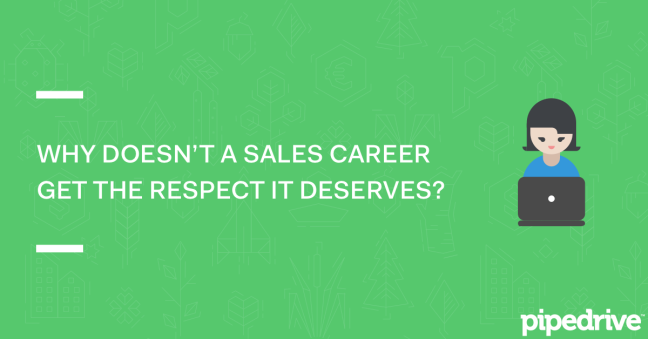 So why does a sales career rarely get the respect it deserves? Had someone asked you what you wanted to be when you were a teenager, you would have mentioned becoming a doctor, a professional athlete, a computer programmer, a rock star, a police officer, an artist, or an engineer. And while having your own business might ring a bell, being a sales professional won’t likely have made your top 10 list. How could it when popular media enjoys unleashing salesman stereotypes that mostly trigger comic relief, pity, or even disdain? From the tragic story of Willy Loman (Death of a Salesman) to the freakish antics of P.T. Barnum, much of the world’s perception of sales professionals still leans on the negative and conjures images of traveling charlatans selling cure-all elixirs in the Old West, unscrupulous used-car salesmen like Danny DeVito’s character in Matilda, and unethical telemarketers like Leonardo DiCaprio’s office gang in The Wolf of Wall Street. Sadly, this perception extends to the academic world. While sales arguably serves as the single most important factor in driving and sustaining businesses, relatively few colleges offer it as a stand-alone course, much less as a degree. What you usually get are a few sales-oriented classes bundled as a peripheral component of a marketing or business management program. Inc.com Contributing Editor Geoffrey James cited this mismatch between business needs and traditional learning channels while the Harvard Business Review provided some gloomy statistics that home in on the irony of sales being extremely important and the mind-boggling reality that only a tiny fraction of business students — both in undergraduate and MBA programs — have actually attended a class in it. What?! This, of course, partly explains why hiring qualified sales professionals seems like hell for job recruiters. Add the fact that most successful sales gurus like Brian Tracy and Dave Kurlan will tell you that selling is tough. Then you’ll realize why many never consider a career in sales. Yet, despite the bad rap, a few people — including the Pipedrive team — go against the flow and actually love sales. And we believe you will too, once you have unlocked the not-so-secret science of reeling in sales success. Not surprisingly, the gurus we mentioned as well as many successful professionals who initially thought of selling as a last resort say they wouldn’t dream of shifting to another career. You learn the skills for success. On-the-job-training for sales professionals covers the development of critical abilities that help you shine in many situations in and out of the workplace. These abilities primarily belong to the category of soft skills that are adaptive, transferable and in high demand across professions and industries. These include negotiating skills, time management, communication skills, listening, social networking, trust building, analytical thinking, presentations, customer relationship management and problem solving. And because sales has been and will always be a tough profession, you’ll need to build character traits like persistence, resilience, self-discipline, confidence and a sense of urgency just to stay ahead of the curve. Now imagine yourself as a job recruiter and you’re interviewing someone who clearly possesses these skills and character traits. What would your hiring decision likely be? You get an unmistakable sense of accomplishment. As soon as you’ve started closing your first deals, you’ll feel that those sleepless nights you’ve spent perfecting your pitch, poring over your presentation deck, examining your clients’ needs from just about every angle and mulling miserably about your chances of success were all well worth it. Nothing brings vindication like the thrill of winning. Everyone likes to win, and for better or worse, sales is largely a win-or-lose game. The best part is, winning in sales won’t go unnoticed. Sales professionals always have a shot at organizational and industry awards, or even simple in-house rankings, praise or recognition. That’s on top of bonuses and commissions (more on this later) companies are eager to give people who successfully sell their brands. Any of these will likely build a sense of fulfillment and pride. But perhaps the icing on top is the realization that succeeding in sales means that a) you helped solve your customer’s problem; b) you made shareholders happy; c) you helped your firm’s tech support and admin staff keep their jobs; and, d) you’re bringing home something extra for yourself or your family. You feel the gold rush. Let’s be honest. Money ranks among the most powerful motivating factors. And that’s where the lure of sales hits the hardest. Sales involve money in a big way. After all, for most businesses, sales operations serve as the primary engine for generating revenues. Simply put: no revenues, no business. That’s why companies handsomely reward successful sales professionals with recognition, attractive salaries, bonuses, commissions, travel accommodations and other perks. In fact, sales-oriented jobs provide some of the highest median salaries in the United States, with sales representatives taking home an average pay that’s nearly twice that of the national average for all occupations, with the best of them able to reel in six-figure salaries. Only a few careers offer an income potential as high as the sales profession does. Beat quotas (easier said than done, though) and the bacon is all yours. You frolic in an exciting, evolving playground. Despite the high likelihood of rejection, false hope, fatigue and other frustrations, selling can be a lot of fun. And it usually is. Perhaps because selling entails a lot of these challenges, a sales career offers healthy levels of excitement and adventure. You get to engage different types of people, analyze emerging market needs, and propose ingenious solutions to different problems. With the rise of big data, consumer analytics and sales acceleration software, selling as a profession is also evolving rapidly, ushering in fresh, new elements in the buyer-seller dynamic. While still hinged on relationships between people and brands at the core, today’s sales industry allows you to leverage awesome tools and access amazingly accurate and timely business intelligence that help automate processes, reduce engagement variables and help you focus more on growing relationships. Incidentally, these relationships often go beyond mere customer engagement since many salespeople also interact with internal stakeholders such as brand managers and product developers, making your network rich and brimming with opportunities. You tread a sure and steady path to leadership. Being battle-scarred has its advantages. No one (especially highly successful pros) will ever tell you that sales is easy. And because sales is a) tough, b) requires hard work, c) immerses practitioners to a variety of unexpected and uncomfortable scenarios and d) poses all sorts of unpleasant risks, people who succeed in it have likely honed their personalities to adapt in just about any terrain and thrive while at it. Not surprisingly, most senior executives have spent some time in a sales-oriented position. This allows them to build people skills that are critical not only in leading departments but also in favorably influencing a brand’s target audience. You get more freedom. Depending on your role and the employer, sales jobs generally offer a flexible schedule. That usually means you’re not bound to a cubicle eight hours a day and you have some leeway in tweaking your working hours to match the buying behavior of your customers. Now that brings a certain degree of freedom in how you manage your daily and even monthly activities. In some companies, sales reps can generally do what they want with their time as long as targets are met. If you’re a sales whiz (read: someone using the right tools to find and engage prospects, and the right skills to close deals much faster than normal), then you can exceed quotas while having more time to spend learning a new skill, feeding your passions or vacationing with family and friends. You get the reassuring feeling that companies need you more than you need them. In a volatile economy, job security — or the lack of it — easily fills everyone’s mind. But if you’re a high-performing sales professional, you have a far better chance of being retained by your company or hired by a prospective employer compared to most employees in other fields when business heads for a downturn. That’s simply because revenues have to continue trickling in even during an economic drought for any company to survive. And given the role they play in a company’s cash flow, salespeople are often the last employees to be let go by management in worst-case scenarios. But even in the event that they do head for the exit, competent salespeople possess critical, transferable skills that will always stay in demand across industries. Regardless of your profession, performing a sales-focused role will always be beneficial to your career or business. Forget about the negative stereotypes cited at the beginning of this article. Consider instead the valuable skills and character traits you’ll develop that will remain relevant as long as there are products, services, brands or ideas to sell.